On a private, wooded property stands a stunning replica of the Borgund Stave Church. Some of the most loved and treasured of Norway’s historical buildings are their stave churches. Of those, the best preserved with minimal changes over the years is the Borgund Stave Church located in Borgund, Lærdal, in the Sogn and Fjordane area of Western Norway. The church was built between 1180 and 1250 AD and its style is known as “triple-nave” stave church. On a cleared area within a private, wooden property in rural Connecticut, there is now a perfect, full-scale replica of this famous stavkirke! The owner of the Connecticut property is a successful businessman with some Norwegian roots who fell in love with stave churches and Norwegian history and culture from his many happy visits to Norway starting in the 1950s. About 10 years ago, Tom decided he wanted to build a perfect replica of the Borgund Stave Church on his property. With the support and encouragement of his wife, Olga, they sought out a builder who would undertake this incredibly complex task. David A. Miller, who had been restoring homes from the 17th and the 18th century throughout New England provided the perfect match. Tom, Olga, David, and David’s wife, Joyce, travelled to Norway to study the details of the Borgund Stave Church. The Norwegian organization that owns and maintains the Borgund church would not provide them with any drawings and would not even allow them to use a ladder to help in the measurements. Undaunted, they took copious amounts of photo-graphs (especially Joyce), made measurements that could be done on the ground level, and then David drew up detailed blueprints for building the church. Four years ago, David, with an average of three helpers, started to build the church. The materials, such as the pine, spruce, and cedar came from various sources. In fact, Olga and Tom drove to Canada, a good source of spruce, to bring home spruce “knees.” They had a problem bringing the wood into the U.S., due to importation restrictions at the time. Every aspect of building this “Heritage Site” had unique problems but they were all solved, often very cleverly. The church structure is supported by 14 rounded pine “staves.” Each stave is tapered and only hand tools were used to shape them. The total height of the church is 35 feet to comply with the Connecticut building code; this is very close to the height of the original stave church. As noted in the interior photograph, the walls are vertical pine boards, and consistent with the original church. The arches between the main beams are built with spruce, because this wood is less likely to split over time and weaken. The roof is covered with cedar shingles, which provide long life due to their hardness. In order to build the roof, it had to be assembled on the ground and lifted up into place with a crane. Design of the roof and all structural areas of the church were replicated from the Borgund church. However, instead of the “stone foundation” used in Borgund, the Connecticut church has a basement foundation. At the arched entrance, there is a rich complex of carvings in pine. This work was done by Rosanna Coyne, a local wood carving specialist, and took about a year to complete. All the other carvings inside the church and all the dragon heads were done by none other than David, the builder and wood carver. 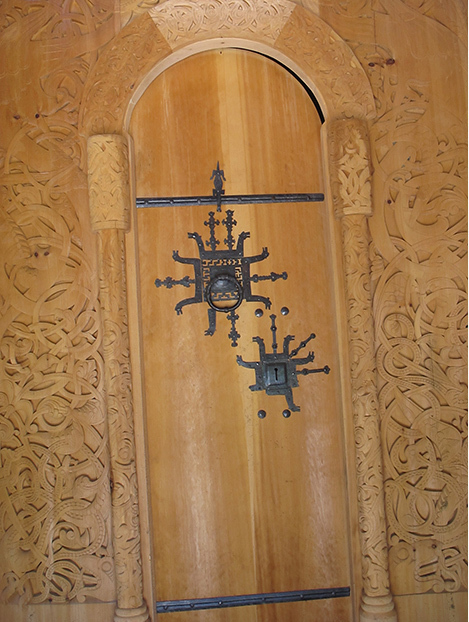 The front door has hand-hammered iron decorations and door lock. The metal work was done by Newton Millham, a local blacksmith, reflecting the actual details of the Borgund church’s door, along with its current flaws. Different beam connections use notching techniques like those of the original, as well as 1200 “nails” similar to the ones used at Borgund. A noted modern improvement is the use of a wood spray which makes the wood less flammable. The plantings and stone work surrounding the church have an understated elegance that befits this powerful building. The beautiful landscaping was designed by Anne Vaterlaus. It turns out that the church interior has excellent acoustics, and the church has already been used for a musical recital and an elaborate 17th of May celebration. The final result of this Herculean project is a monumental display of Norwegian Art in a pastoral setting that leaves anyone lucky enough to see it in awe.